Designed by Richard Borg, BattleLore is a briskly paced game for 2-4 players. The time is the Hundred Years War. All of Europe is engulfed in the flames of battle. Armies of French and English troops lined up alongside Goblin and Dwarven mercenaries. Mounted knights ride down on archers firing arrow after arrow to slow the advance. War Councils, armed with the power of Lore, cast spells of horrifying might. Will you take up a banner and march to war? 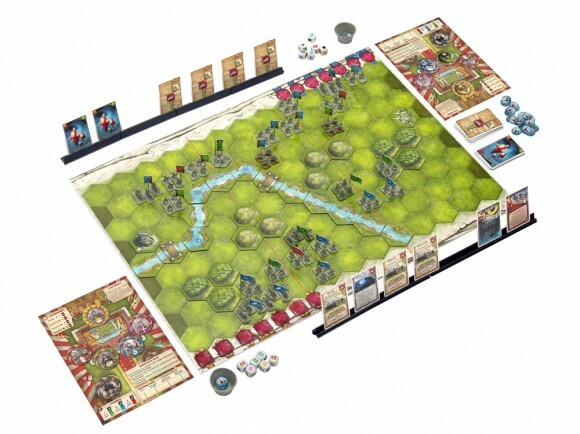 Battlelore, by Richard Borg, originally published by Days of Wonder, now by Fantasy Flight Games, is a light wargame utilizing the Command and Colors System. It is set in the world of Uchronia, a fantasy version of our own world, during the time of the 100 years war. This box is PACKED with over 200 miniatures (no assembly required)! There is enough to field 2 Human armies with Dwarven Mercenaries on one side, and Goblin Mercenaries on the other. Though they are begging to be painted, it is not necessary because each unit is assigned a banner bearer that holds a flag that contains the unit’s information (Color and Weapon Symbol). There is also a beautifully illustrated 80 page rulebook, dozens of terrain tiles, 60 Command cards, 60 Lore cards, 12 dice, and lots and lots of tokens. Please note though, Fantasy Flight Games is not currently printing new copies and have provided “repurposed French Editions” that include English components, but a French Rulebook. The rules can be downloaded at Fantasy Flight Games website. For those not familiar with the Command and Colors System, I will try to give a brief overview. Each player will have a War Council with some advisors of different levels. One of those on the council is the Commander. Your Commander’s level determines how many Command Cards you may have in your hand. On your turn you play 1 Command Card, activate the units specified by the card, move those units (if you want to), then resolve any battles in whatever order the attacker chooses. There are a variety of Command Cards to choose from. The majority are “Section” Cards, and allow you to activate a number of units in a specific Section (Left/Center/Right) of the Battlefield. Other Command Cards allow you to activate a specific Color (Red/Blue/Green) of units based on your Commander’s level. After you are done resolving all your activated units, you draw a new card and your opponent takes his turn playing a Command Card. The rules to the game are quite simple (but that is a good thing) and are designed to be learned slowly. The game comes with a Scenario booklet that slowly adds different types of units and different types of terrain. It also slowly introduces the use of Lore (the game’s Magic system) and the rules for building your own War Council. I do recommend playing the first few scenarios to get familiar with the system before adding in all of the units and Lore Cards. The game also comes with handy reference cards that you can keep out for reference so you do not have to continually check the rulebook. For example, if a scenario calls for Forrest and Hill Terrain, just grab the Forrest and Hill reference cards. No need to have the River or Bridge reference cards cluttering your table. Battlelore is a face paced game. No referencing complicated combat tables. Most die rolls are simple. Take a number of dice based on the strength of your attacking unit (Red-4, Blue-3, Green-2), modify this number by the terrain type (typically terrain gives a limit to the maximum dice rolled), and then apply any bonuses (usually from Lore Cards). Each unit has a weapon type that determines what it “hits” on, usually the opposing unit’s banner color. Those handy reference cards hold all the information about the unit weapon and make resolving combat quick and easy. There is much more to the combat system (such as causing units to retreat, gaining ground or pursuing fleeing units, panic losses, etc) but it is a streamlined system. You will quickly memorize most of the information and find you will not need to use the reference cards for long. A quick note about the Lore in BattleLore… There are no “magical units” in the game. Instead, all Lore Cards represent spells cast by a member of your War Council. These cards generally give boosts to your units or hinder your opponents. They are paid for with Lore that is collected by rolling the “Lore” symbol in combat, or by taking 1 (or 2) Lore tokens at the end of your turn. All in all, the Lore cards add some fun fantasy elements to the game and seem to be balanced enough (cost enough) that they do not overwhelm the game. This game has many expansions. The most important expansion in my opinion (for replayability) is the Call to Arms expansion. This expansion allows a variable deployment for your armies so you do not have to play scenarios in the book. About the only negative thing I can say about BattleLore is the set up (and tear down) time, especially when playing with custom War Councils. But part of this time intensive set up is also one of the reasons BattleLore is worth its weight in plastic… there are lots and lots of miniatures. If you can find this game for a reasonable price, pick it up! A game by Richard Borg, someone I know about since I owned a copy of his Command and Colors Ancients game. So low and behold he made this fantasy based version with some bells and whistles. Now by nature I’m a war gamer, WWII, WWI, even modern but fantasy hmm. Well I do like fantasy and war so I picked up a copy of this when it first came out and I was glad I did. Let’s get onto my review/observations and comments. Ok, I have to admit I did not type in all these, there was just too many. But I will point out some of the things I like and maybe don’t like. All the components are top notch, The little miniatures even have their own try to put them in, well not all of them, only the one that have banner. The other miniatures pile into a square part of the tray. Now this is not the greatest thing, it make set up a bit time consuming. So you might want to make your own storing system. The miniature themselves are awesome and there are a lot of them. If your into paining miniatures they’ll look even more awesome. The Map is good hard heavy card board and colorful and is divided into 3 sections, right, left and center. Flip over to be combined to another battle lore map for an epic game. The edge has a place to keep you captured banners. The dice are cool, but wish they were not wooden with the symbols painted on them. It wears of over time. The cards are good quality and have nice art work on them. They are of a quality that will last with a lot of use. The card board pieces are all heavy stock and have nice art work to represent what they represent. Oh, I almost forgot about the rule book, 80 pages. This might sound like over kill, but this rule book is the best. It’s full color, with immense amounts of examples and illustrations. Many of the pages are simply full color illustrations, and it really is a pleasant book to leaf through. So over all I’d say BattleLore quality is outstanding. ** I cut down the detail in the list of things that come in the box. I think it might have been to over whelming when looking at the review. –	It scenario based, box game has 10. –	100 of scenarios are available online. –	Online system for generation your own scenarios. –	Lore system (magic) change up the scenarios. (See below). –	War council. (See below). –	A bunch of expansion packs to bolster your armies. –	Putting 2 BattleLore sets together to have huge battles. I like these rules, very easy to teach new players. There is some rule complexity, but they are easily picked up. There dozens of reference cards included to aid in remembering what does what in the game. Update: I left out one thing; in BattleLore moving your units is done by Command Cards. These cards are drawn and are used to move your units in the left, right or center of the board. The fact is that sometimes, you might not have the cards you want to move your guys. This is a pretty neat mechanic which is found in most Richard Borg systems. As always good tactics and correct play of your commands cards will win the day, and a bit of luck. So I’ll point out a couple neat things I like about BattleLore. First up is the lore system. Each player has a different Lore Master and each one has their own Lore cards. These cards let player spend their Lore tokens to make magic attacks. These vary from things like, chain lighting, increasing units movement, healing, rolls extra battle dice during combat and the list goes on. Players can get there Lore tokens at the end of their game turn, either one token and one Lore card or two Lore cards. A player can also acquire Lore tokens when during combat and if they roll a Lore symbol on the dice. So sometimes losing is in combat can have a pays off. The next is the War Council. In some scenarios players can take either a preset War Council or create their own. The players get six “levels” to build their council with and can take that many levels of the Commander, the Wizard, the Rogue, the Cleric, and the Warrior. None of the characters can have more than three levels, and their levels affect game play. The Commander is the only one who has nothing to do with Lore; instead, he directly determines how many Command cards a player may have. Normally a player may only have three command cards, plus one per level of the Commander. So a player who takes a level three Commander will have fewer options with Lore but a great deal more maneuvering on the battlefield. The other four members are considered Lore Masters, and the level of the highest one determines how many Lore tokens and cards a player starts with, as well as the maximum number of cards they can have. There is a deck of Lore cards for each of the four members, and they are shuffled into one large Lore deck to start the game. Warrior cards affect battle results and rolls; Cleric cards heal and can do some massive damage, Rogue cards allow treachery and deceit, and Wizard cards are often powerful attacks. Depending on how you want to run your army, it’s very important how a player sets up their initial council. There are also other things too I like, battle back, Cavalry, mercenaries and monster. With all this and hundreds of miniatures this is a game that should not be passed up. If you a fan of Command and Colors or Memoir 44 and like fantasy I’d say this game is a must buy to add to your game collection. Caveat: I own almost all of the expansions, so I’m basing replayability on that. I have played this game since it came out and, in fact, own 2 copies to have enough units to field Epic Scale battles. I used to be an avid wargamer (Warhammer 40K, etc.) and wanted my now 7-year old son to play them with me. Battlelore has taken a lot of deep strategy and boiled it down to its quintessential points without making it over-simplistic. Ethan loves the fantasy theme and has enjoyed playing since he was 5-years old. I’ve played it with my nephew since he was 14 and we’ve all been playing it on and off over the past few years with renewed interest whenever an expansion set comes out. We especially like the new creatures and heroes that get added from time to time. They breathe new life into the game. The new specialist cards and card-based drafting method of creating your own armies make for a fun time that’s faster than those that are point-based. The miniatures are nicely detailed – though the flag poles are prone to breaking and the flags may come off from time to time. My dice were replaced by DoW when they wore out (and when DoW were the publishers…). Other than that, the game is solid. The rule book is generally excellent. Battlelore is a game that my family will probably play for a long time to come. I have expansions already wrapped for Ethan’s birthdays for the next few years (don’t tell him, though!). -Keeping units in formation allows them to “battle-back” when attacked. -Lore system keeps things interesting, but also evens out the game. -Lots of awesome plastic minis! Overall, this game is excellent for two players. It is fun, fast, engaging, and has just the right degree of complexity. If you love tabletop wargaming but can’t get your wife or kids to pickup a heavy wargame, this game fits the bill. Rules are easy to understand and gameplay is light. Has just the right amount of strategy and luck to keep most gamers attention without scarring off your loved ones. Components are top notch and rules are written so you can play and learn as you go, with increasing level of complexity and choices. Any easy recommendation. Lots of fun. The way battle is done (dice) can be frustratingly random but that’s probably a decent trade-off for having battle rules that are easy to follow without having to consult a spreadsheet every time you make a move. There are still a lot of rules but the game does a good job of slowly easing you in them through introductory scenarios. Initially, I steered away from this game for 2 reasons. 1. Lore. I have played Commands & Colors a lot and I really like the fact that you can basically play the cards and the strategy that you want without your opponent somehow negating it. I was worried that Lore would add too much of a “nuh uh” factor in the game. But it really doesn’t..
2. The MANY expansions. I was really concerned that I would go crazy and have to own all expansions. So far that hasn’t happened. So far…. After giving in and playing it on Vassal, I find that it’s equally strategic to Commands and Colors and has a very strong fantasy theme and feel. I really dig it. Great quality production by DoW – FFG already started to save on the amount of plastic used. It’s a shame that FFG stopped this line. Very entertaining game – sometimes too complex and some rules just put there to be there (making the game unnecessary complex), however still enjoyable. Considering that MM44 grew into breakthrough and overlord (and some paper maps) – BL had a lot of potential. Even Borg said that there are some expansions already designed and tested – but never released. Looking forward to it – one day. i had Memoir 44 before buying this. Several years and expansions later, and I’m thinking I’d just stick with Memoir 44. Battlelore adds some complexity through the lore cards and other expansion rules that slows the battles too much for my taste. Setup alone can be rather time consuming. If you’re wanting to scratch the fantasy battle itch, I’d go with Heroscape or others. One of the best games that i have ever played is Battlelore. Great componnets great stories and thousands on net for many hours of play. It’s very eazy to learn and the best thing about this game is lore. I love this game and with the expansions that this game has it goes to an other level of play. My son loves this game! I’m always getting him expansions. He is a fantasy oriented player. It allows a historical simulation oriented guy like me to play Poitiers and Crecy while he is moving his dwarves or goblins. shame on FFG that such a great game was “killed”. one of my favourite strategy games. light, easy to learn. An easy to learn wargame that sparks interest for the whole family. Played it regular with my wife and kid. Thanks to the scenarios every aspect gets taught a step at a time. This way my wife doesn’t get flooded in the 80 page rule book and with my kid we can easily replay the starting scenarios with less fantasy and lore aspects. The only downside for some people might be the fact that dice mainly control the chances to win and less the strategic mind. 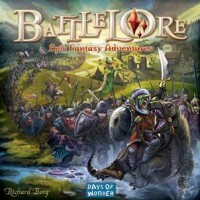 Add a Review for "BattleLore"